This thirty-minute workout has everything you need to cap off those arms and give your shoulders the attention they deserve! Thirty minutes in the weight room isn't much time—but it's enough, if you know how to take advantage of it. Any single muscle group can be trained hard and trained well in the length of a sitcom episode, but to do it you'll need laser focus and a good plan. Don't believe me? Give this delt workout a try. Rear delts are a neglected group so we're going to bookend this workout with moves to make them a priority. You can do these flyes with cables or a reverse pec-deck if your gym has one. Either way, give it 3 sets of 20, 15, and 10 reps, taking 60 seconds of rest between. Remember, as the reps go down, the weight goes up. Dumbbells allow you to take the weight lower than either a barbell or machine. 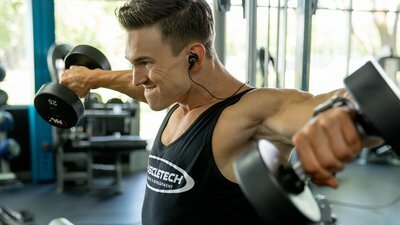 Lower the weights as far as you comfortably can with good form on each rep. Stop short of lockout at the top so you can keep tension on the delts and off the triceps. The first two sets are straight sets, first 12, then 10 reps. For the third set, perform a dropset. Rep to failure, reduce the weight, and keep going. You've got 60 seconds to rest between the first two sets. Don't rest on the dropset until you reach failure twice. Two for the price of one—what's not to love? For the front raises, hold the plate at 10 and 2, just like you would a steering wheel. Raise the weight to shoulder height, being sure to keep the traps out of the movement, then lower with control. Do not arch your back or cheat your shoulders by letting momentum do all the work. Once you hit 10 reps, grab two dumbbells, have a seat, and knock out those lateral raises. Sitting helps you focus on the lateral head better than standing. If you really want a challenge, use kettlebells for this exercise instead of dumbbells. You get no rest between exercises and 60 seconds between supersets. This exercise focuses on each lateral head individually. Cables keep tension on the muscle and give you a fixed path of motion, which only helps you at this point. Your first two sets are straight sets. On the final set, go to failure, count to 10, and do more reps. Do this with each side. Since time is of the essence, you only get 45 seconds of rest between sets. You started with rear delts, and now it's time to finish them off. Use a barbell with light weight so you can focus on the contraction. Use at least a shoulder-width grip, and if you can go a little wider, do it. The wider the better for targeting the back of the shoulder. Pull up to approximately shoulder height—the bar should never reach your chin. Complete 25 reps, then rest 45 seconds before tackling your second and final set. And you're done! Boulder shoulders in under 30 minutes. You'll even have a couple of minutes left to admire the pump.